Welcome to the NBA Live 2001 portal! 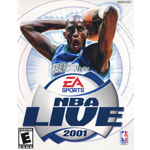 This is a central hub for all the NBA Live 2001 content here at the NLSC including news, reviews, feature articles, downloads and more. In this week's Wayback Wednesday, Andrew takes a look back at the DBF files in the PC versions of NBA Live, and how they helped in modding the series.